The Wings of History display of the Wright Flyer. This replica was originally built for Irv Perch, owner of the Morgan Hill, CA restaurant, ‘The Flying Lady.’ Ownership of the Flyer passed to Vaughn Lamb, one of the Wings of History founders and Mr. Lamb gave it to the Wings of History Museum. The replica is full size and is an accurate, non-flying reproduction of the original 1903 Wright Flyer. It was exhibited in many California locations during the 2003 Wright brother centennial. Just eighteen years ago, on the seventeenth of December, 1903, after centuries of endeavor, man for the first time was lifted into the air by a power-propelled airplane. Flight seems so easy today that one naturally wonders at the long delay in its accomplishment. Yet eighteen years ago on account of the thousands of failures, flying was classed with perpetual motion and the few who expressed belief in its possibilities were looked upon as mentally unbalanced. In 1901 my brother Wilbur and I, having proved by actual gliding tests the inaccuracy of these tables, began a scientific study of the subject. We designed new tables of measuring instruments and made measurements of hundreds of different wing surfaces in a wind tunnel. It was due to the accuracy of these measurements that we were able, in 1903, to design a new type of biplane, almost entirely from a calculation, which was able to lift itself and operate in the air with a crude motor weighing more than twelve pounds per horsepower. We had already developed a new system of control, the system with which our name has been so largely connected, but this system of control would have been of little use without our wind tunnel work which enabled us to design a machine which would lift itself. 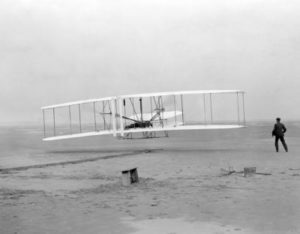 The longest flight on Dec. 17, 1903, was fifty-nine seconds duration at a speed of 30 miles an hour.